South Dakota’s Badlands . . . | A balanced diet . 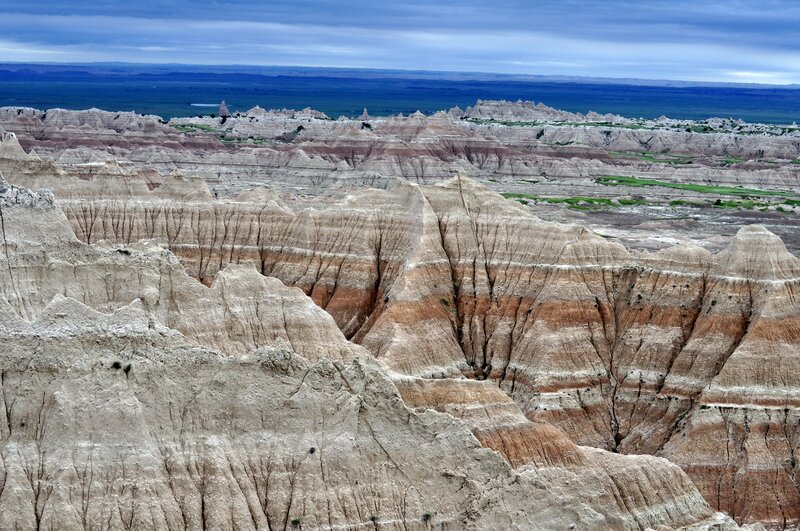 . .
South Dakota’s Badlands . . . It was a Tuesday morning, early June. We’d reached Chamberlain, South Dakota on the banks of the Missouri River the evening before, having traveled down from St Paul, MN in glorious sunshine. To the west, however, there was an ominous glower in the sky that was already beginning to darken by breakfast-time. Checking the Weather Channel we learned to expect some thunderstorms as we crossed the Great Plains towards our next destination: the Badlands. Stormy weather? That was that half of it. At one point it was raining so heavily I had to pull off the highway (I90) at one of the designated viewpoints. Not that we could see anything. However, after about 30 minutes we were able to continue our journey, and later found out that we had skirted the northern edge of a major storm tracking across the plains from west to east, accompanied in some places by baseball size hailstones. Luckily we missed those, and by the time we reached the Badlands National Park, the storm had passed, the skies brightened (a little) and we were able to enjoy the Badlands formations in all their glory. Having now traveled across the Great Plains for several hundreds of miles, my respect has increased enormously for the early pioneers who crossed these open spaces in the 19th century on their way to the west coast, in California and Oregon, to make a better life for themselves. Not only did they have to combat the natural obstacles of the landscape – the plains, the Rockies, and the Sierra Nevada – but also hostility from the native Americans whose land they were crossing. When the era of the building of the transcontinental railway began in the 1860s, tensions and hostilities multiplied, but by the 1890s the various native American tribes had been defeated (massacred in many instances), moved to reservations, and their nomadic way of life (along with the vast herds of bison) had disappeared for ever. 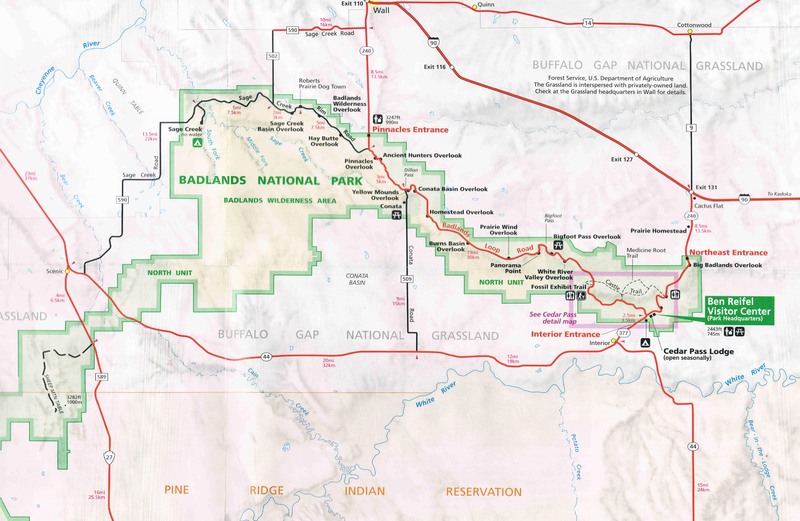 Surrounding the Badlands is the Buffalo Gap National Grassland, and one can imagine what the Great Plains must have looked like in their original pristine state. There are also some important Indian reservations to which various tribes were banished in the last quarter of the 19th century – Wounded Knee is quite close by as well, where the infamous massacre took place in December 1890. Leaving I90, you turn south to reach the Badlands National Park Northeast Entrance, passing by Minuteman Missile National Historic Site – which we didn’t bother to visit. We were much more interested in beautiful landforms, that echoed our visited in 2011 to Arizona’s Painted Desert (although it is much warmer there). The winds really blow on the Great Plains. In the park we took the main Loop Road, but then continued on the Sage Creek Road for about 5 miles before turning north and rejoining I90 at Wall. All the main viewpoints (‘overlooks’) are well sign-posted, the views spectacular, and on the day we visited, the contrast between the landscapes and the sky gave us some pretty dramatic images to cherish. 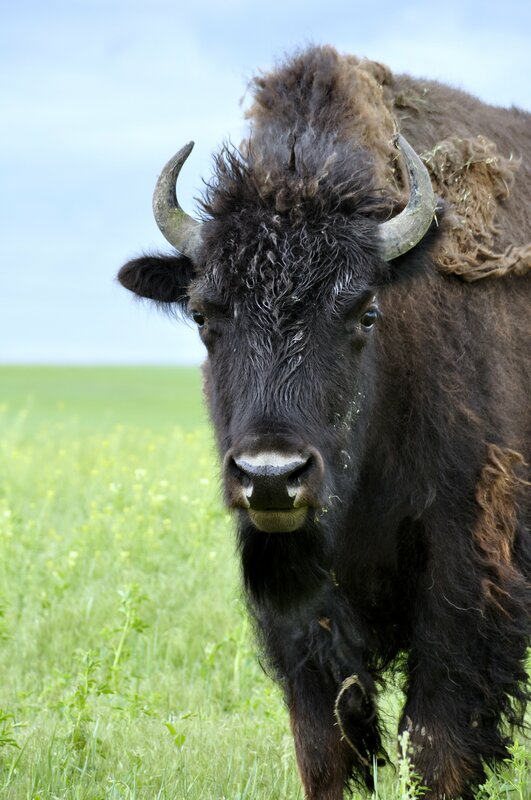 Stretches of grassland are home to a herd of bison, and you are left wondering what these areas must have looked like in the mid-19th century when these magnificent beasts could be counted in their millions. The Badlands after the storm . . .
All in all, South Dakota’s Badlands are worthy of anyone’s time – they are truly magnificent. This entry was posted in Out and about, Travel and tagged Badlands, Badlands National Park, Great Plains, South Dakota, travel, USA.